This is an incredible artbook. The level of quality and thought that goes into putting this book together is at the same level as the three Zelda books that came before this, namely Hyrule Historia, Art & Artifacts and Encyclopedia. 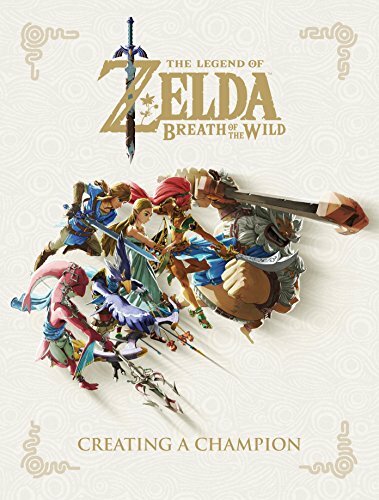 This is a humongous 424-page hardcover that features the art and making of The Legend of Zelda: Breath of the Wild. This is really comprehensive. Of all the video game artbooks I've reviewed, not many come to this level of detail. For the artworks, you get to see lots of designs for the characters, props, weapons, environments, maps and in game stills. The designs for the world and the characters look great. I love the almost anime like drawing style and colouring. The other highlight of the book is there is a lot of commentary by the artists and staff that created the game. They talk about everything, character designs, meanings to the ruins, including interviews with Hidemaro Fujibayashi (director), Satoru Takizawa (art director), Takumi Wada (illustrator) and Eiji Aonuma (producer). This book shows you how much effort and the level of care that was put into making the game. Hats off to the company and the staff for creating such a beautiful game and this incredibly insightful companion artbook. This is one of 2018's best artbooks. Most highly recommended. I would probably get the Encyclopedia because it's really insightful. Second choice is Hyrule Historia, again for the text. Zelda art is nice but the series has so much history so I would love to know everything there is about it. from tehes 4- which one is the best for those who seek for art and sketches? not Breath of the Wild? Art and Artifacts have more art.